When we think of the civil rights movement, we may think of a country divided. But Martin Luther King Jr.’s message and the vision that galvanized so many to act bravely in the face of fear, consisted of values that any person in any corner of the world can aspire to. They are values that, when lived, have the potential to unify. So when you are talking with your children today about why we celebrate Martin Luther King Jr., be sure and include those values that he articulated and modeled and that so many were able to demonstrate through their actions. Think about small ways in which you might demonstrate those values in your day-to-day life. If you do so, you will be honoring the memory of all those throughout time whose lives and livelihoods were threatened and despite that, made choices that aligned with the best of who we can be. Equality. He said, “I have a dream that my four little children will one day live in a nation where they will not be judged by the color of their skin, but by the content of their character.” We can share with our children the value of equality. Though there are differences among every one of us, there are more aspects of who we are that unite us. Every person has the right and responsibility to express who she or he truly is. Ask: How can you demonstrate equality in family life? How can you help children understand equality not as sameness but as appreciation and respect for all? How can you teach your children inclusion? Hope. He said, “We must accept finite disappointment, but never lose infinite hope.” It’s incredibly easy to complain about our life circumstances. But if we view ourselves as individuals with choices who can learn from our mistakes, we begin to take responsibility for our actions. And we can work on forgiving those who have hurt us. We can reflect on and evaluate our mistakes so that they become our curriculum. And with that learning mindset, we have hope. Because there’s always a chance to grow wiser and make better decisions. We want our children too to learn that there’s always a second chance. There’s always room to grow and give our best. And there’s always an opportunity to contribute who we are to better the world around us. Ask: When we approach a problem with our children, do we show hope (or do we show a resignation or feel they might let us down)? How can we incorporate expressions of hope? How can we increase encouraging words and our show of confidence that each family member can make positive choices? Character. He said, “The function of education is to teach one to think intensively and to think critically. Intelligence plus character – that is the goal of true education.” Character is the true expression of an individual, their integrity. It means knowing and expressing who we are – self-awareness – which requires regular reflection. It also means regularly examining ways we can fine-tune who we are and how we express to benefit ourselves and others. So morality or ethics is a critical part of the equation. We only pursue the ways in which our lives can contribute to the deepening of our individual expression and measure that in terms of how it also contributes to the growth and development of others and the environment. Ask: What are ways in which we promote the character of our children in our family life? How do we encourage responsibility? How do we offer choices to give our children practice with thinking about consequences? How do we guide our children to consider others’ perspectives in any given problem? How do we offer a model of empathy and compassion by expressing others’ viewpoints ourselves? Small Actions: Though children may experience an inner voice, they do yet have an understanding of their inner moral compass and how it may steer them. In addition, that sense of ethics is constantly changing in all of us – being informed by our environment and by learning from past challenges. So consider how often you guide reflection with your children. Do you ask them questions about their thinking? Do you ask them about their choices and the impact on themselves and others? Those reflections will help promote a child’s thinking skills so that they learn to go through those mental processes on their own when faced with difficult decisions. Find ways to practice reflective thinking with them and those experiences will significantly contribute to their ability to handle problems at home, at school and in the future lives. Peace. He said, “Peace is not merely a distant goal that we seek, but a means by which we arrive at that goal.” We still live in a world in which many believe that violence can teach, that violence can solve problems. Martin Luther King Jr. taught that it’s impossible to use violence to end violence. Instead peace must be the vehicle for establishing peace. So many of us have inner turmoil we are actively managing day to day. As we work on dealing with our own pain and suffering, we make regular choices about how we cope and process those feelings. If we stuff them down and allow them to build and finally explode, then we are putting our loved ones in danger. Instead, we can set boundaries for fighting in family life such as, “We will never use violence or physical harm of any kind in our arguments.” And we can plan for our upset emotions ahead of time so that we never risk hurting family members. We can find ways to express and let go of our hurt in safe, constructive ways over time. Ask: How can promote peace in my family life? How can my words become more empowering and less accusatory? How can my tone of voice become one of inspiration, not condemnation? And how can my smallest actions particularly when angry show that I value peace as the vehicle for promoting peace in the world? Small Actions: The best way each of us can promote peace in the world is by starting in our family lives by not harming those we love through words or actions. Becoming planful about how we manage our emotions can save us from ever regretting our reactions in heated moments. Please visit the Family Emotional Safety Plan to download a simple template you can use for yourself and to start a conversation with family members on this critical issue. In addition, take the Fighting Fair Family Pledge which articulates clear boundaries for arguing while maintaining respect for others. Service. He said, “Life’s most persistent and urgent question is, ‘What are you doing for others?’ The theme of service – of doing for others – is a core value for all of our greatest moral leaders including Mahatma Gahdhi, Nelson Mandela, and Mother Theresa. We have an epidemic in the U.S. of depressed teenagers who could not be so if they knew how their unique qualities could significantly contribute to the world around them. Giving offers us a sense of purpose. Ask: How do we develop a service mindset among each of our family members? Do we promote and cultivate a culture of kindness, help, and support in our family life? How could we do more to appreciate others and offer regular gratitude for the abundance in our lives? How could we, as adults, model noticing needs and offering care for others? Small Actions: Notice and appreciate kindness when you see it happen around your home. “You took care of cleaning up your mess and I didn’t have to ask you. That’s taking responsibility and I see you doing that.” Point out kindness when you see it in the world. “Did you notice that woman help that older gentleman through the door at the grocery? How kind of her to notice he needed help.” Do it enough and you will begin to hear your child finding examples of kindness for herself. He said, “I refuse to accept the view that mankind is so tragically bound to the starless midnight of racism and war that the bright daybreak of peace and brotherhood can never become a reality… I believe that unarmed truth and unconditional love will have the final word. So if the only vehicle for peace is by acting out of peace and love, then forgiveness is core to our task. And our job as parents becomes to equip our children to learn to forgive. They will encounter pain despite our best efforts. But we will give them the tools of resilience, of strength if we offer them guidance on the process of healing and forgiving those who have hurt us. Ask: How do we forgive in our household? Do we find ways to make reparation for harms done? And do we find words and actions that show we are asking for forgiveness? And are we able to grant pardon when someone harms our feelings? Are there new ways we can go about including forgiveness as an expression of love in our family life? Small Actions: Consider how you model owning your role and responsibility in any family problem. How do you articulate your area of responsibility? When you do, it opens the doors for others to take responsibility for their roles and it knocks down the wall of “me versus you.” Find times to have honest conversations without judging your children’s actions. Allow them to tell you their problems while you listen with compassion. They will come to you with bigger problems down the line if you offer this kind of small support in day-to-day situations. Consider how you handle hurts whether your own or your child’s. How can you model the language of forgiveness? How can you guide your child to think through actions they might take to make up for harm they have caused? For more ideas, check out my article on “Second Chances – Teaching Children Forgiveness” on the NBC Parent Toolkit. Of course, love is at the heart of it all. Though outwardly, some may choose to hurt or exclude others, we can be certain that inside, they too feel pain and are convinced they are not loved yet require love desperately to soothe their wounds. Children can acquire their own pain not just by yelling or spanking parents but also, by parents ignoring their needs – whether physical or emotional. Show your love through your attention. Put down devices. Turn off the television. Take their hopes seriously. Take their fears seriously. Really listen to what they are telling you. That is the small, slow but powerful way you can best teach your children to love. Thank you, Martin Luther King Jr. and all those nameless individuals who have demonstrated their values through their daily courageous actions. May we all attempt that show of strength. Love this post. I’m sharing. 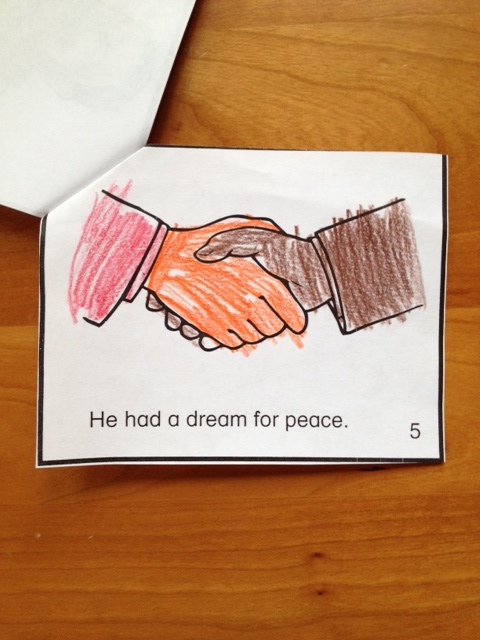 Great way to break down MLK’s timeless messages to children and how we can adhere to those messages as well around children and amongst ourselves. Great points on how to teach our children the right values.